We are very excited to announce, launching in Fall 2018, BIOL 184X, Explore NEPA. Explore NEPA is a full-semester First Year Seminar for entering University of Scranton students who wish to fulfill a Natural Sciences curriculum requirement while learning about the natural landscape of Northeastern Pennsylvania (NEPA) and what it has to offer for community members interested in pursuing healthy lifestyle activities. Explore NEPA, first launched under the name Extreme Physiology: NEPA Edition as a four-week summer course, will in its new format introduce incoming University of Scranton students to the enriching outdoor opportunities available in Northeastern Pennsylvania as they learn about the physiology of human performance and the responsible stewardship of Pennsylvania’s beautiful natural resources. The course, BIOL 184X, is a new University of Scranton General Education course with Natural Science (E) designation. It also is designed to fulfill a course requirement for Scranton’s Environmental Studies concentration. Throughout the course, students learn first-hand how aerobic training enhances human performance and health, and they do it by training in some of the region’s most beautiful and challenging environments. Click on the EP NEPA Blogs tab above to read about student experiences from our initial offering of the course during Summer 2016. The course is made possible through a partnership between the University and the Pocono Forests and Waters Conservation Landscape (PFW CL). Biology faculty Terrence Sweeney and Tara Fay deliver the physiological aspects of the course, including laboratory pre- and post-training fitness testing of the students and themselves, as well classroom lectures and activities interspersed with outdoor experiences across the Pocono Forests and Waters landscape surrounding the Scranton community. Pennsylvania Environmental Council (PEC) Vice President Janet Sweeney, External Lead for the PFW CL, leads an Activity Site and Outreach Steering Committee. Committee members, who serve in their professional capacities as stewards of Pennsylvania’s natural resources, provide the broad expertise that enables us select the very best sites for the courses training activities – and at the same time broaden the learning outcomes of the course. Sweeney reaches out to Pennsylvania Department of Conservation and Natural Resources (DCNR) regional advisors and parks and forest managers, local land trust preserve managers, and trail groups to arrange the outdoor class activities and venues, to serve as on-site speakers, and to coordinate class service projects. Between biking 28 miles from Clarks Summit to Nicholson and back, kayaking on the Susquehanna River and Peck’s Pond, hiking in Ricketts Glen and Lackawanna state parks, and clearing Japanese Knotweed from the shore of the Lackawanna River (to name just a few of the activities), the Summer 2016 EP NEPA students were immersed in the natural resources of the region. advancing the PFW CL’s core goals of conservation, community, and connections. 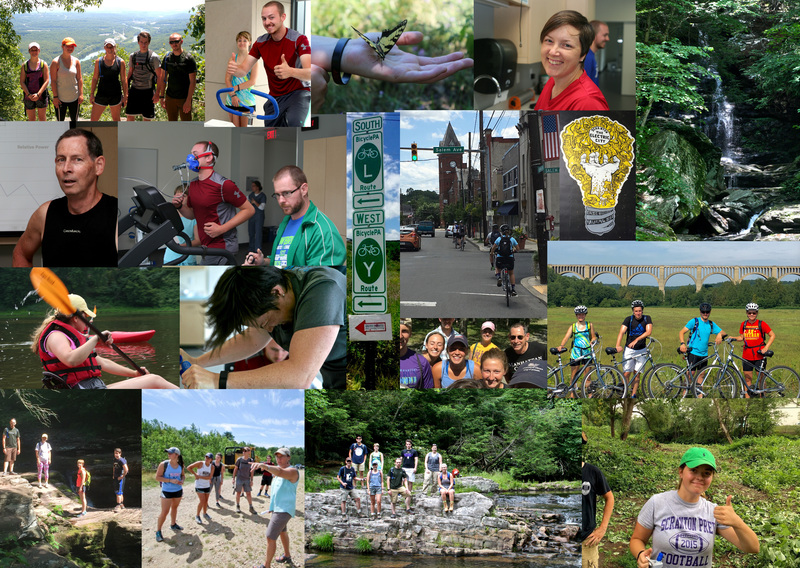 Connections – introducing students to the growing trail network in Northeast Pennsylvania and the people who are working tirelessly to build, maintain, and connect these trails. BIOL 184, EP NEPA highlights the NEPA region via a wide array of outdoor activities, such as hiking, bicycling, running and kayaking. Optional activities, such as whitewater rafting, may be scheduled on weekends. Course enrollment is capped at 10-12 students. Students must apply for enrollment in the course to ensure that they are able to carry out the physical activities that course participation will entail. Students admitted to the course also will have to sign indemnity and hold-harmless waivers, which will indicate an understanding of and acceptance of responsibility for the risks that are associated with course participation.